We are pleased to announce already fourth season of the greatest StarCraft 2 League in CIS, where the best players from Europe, Korea and North America participate. 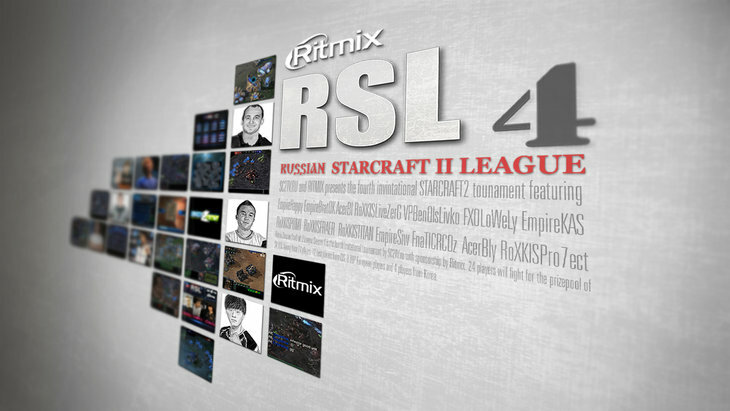 Welcome 2013 Ritmix Russian StarCraft II League Season 4. 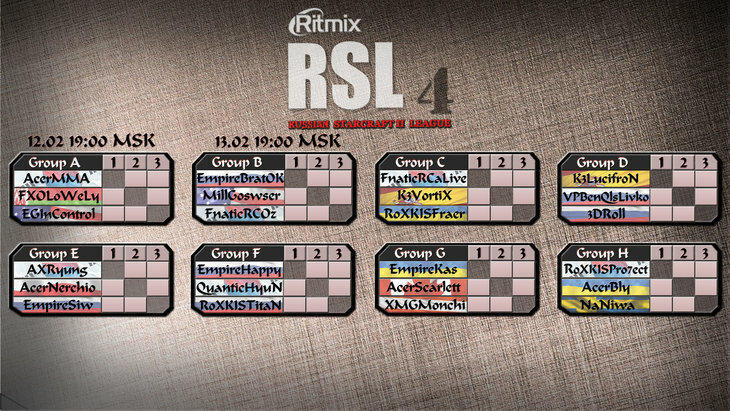 Ritmix RSL IV is over. Since the last season prize pool has been increased to $95oo and will be divided between two different events. And $2ooo will be raffled in special showmatch series. MMA goes to winners bracket, Lowely goest to lower bracket. Oz goes to winners bracket, Goswser goest to lower bracket. LucifroN goes to winners bracket, Slivko goest to lower bracket. Bly goes to winners bracket, Naniwa goest to lower bracket. HyuN goes to winners bracket, Happy goest to lower bracket. VortiX goes to winners bracket, Fraer goest to lower bracket. Scarlett goes to winners bracket, Kas goest to lower bracket. Ryung goes to winners bracket, SortOf goest to lower bracket. SortOf replaced nerchio, who cancelled his participation. 24 players divided into 8 groups of 3 players. 1 zerg, 1 protoss and 1 terran. No mirrors. The group played in 1 Round, Best of 5, Round Robin. In the case of equal rates for all three players held the Tie-break games with the Best of 1 on the same system. Tie-breaks are held until defined all the places in the group. First place in group advance to Winners bracket and second place in group advance to Loser bracket in Playoffs. Best of 5. Finals — Best of 7. KeSPA Neo Arkanoid — Akilon Flats — KeSPA Neo Planet S — GSL Whirlwind — GSL Cloud Kingdom — GSL Entombed Valley — Ikarus. I like RSL, hope you guys can keep this tournament up! Wonder who the last Korean invite is though, maybe HyuN or Leenock. Oz is switched with HyuN! RSL is becoming one of the best online leagues. I'd be stoked to see Incontrol just dominate this... but I mean, I can't help but think that's one hell of an uphill battle. Probably the biggest underdog story we've seen in SC2 since Thorzain at TSL3 to be honest. Incontrol eh. I assume this is still WoL? From a spectator pov, I really like the format. So, what is the schedule? When can we expect the games to begin? Arkanoid in the mappool and sorry if this is a bit of a dumb question, but who is pro7ect? Yes! My favourite online league is back (if you don't count IronSquid^^)! Great players, format is great, it doesn't take too much time with only three players per group and produces awesome games, it's fun with the handpicked seeding because you don't get mirrors, etc. Any chance ToD will be back to cast in English? Edit: Also, why do you always write the letter o instead of 0? It looks weird. Next week we hope to start. He is progamer from RoX.KIS. Quite popular in CIS. Pretty sure there'll be one, two Protoss, one Zerg and one Terran left to be announced, I don't think we'll have two EU Protosses and only T/Z from KR, that wouldn't make much sense. Maybe Oz or Creator will come back. What? Standard map pool format. That is kinda the shame the alternative map pool format of Season III was something i really liked. It could have done without some of the more ridiculous maps but overall i really enjoyed the way alot of maps were added to the pool and pros were still forced to be able to react to each and every map, rather than just being able to decide constant vetoes. Still an intresting mappool overall through. Arkanoid is a risky pick. The basic key to beating a priest is playing a deck that is terrible. Speaking about the mappool - we're trying to balance between pro's and viewer's thoughts. Progamers are not so glad to play on island maps and so on. That's why we're picking maps like Arkanoid and Icarus, which are pretty unstandart in some ways, but also staying with Cloud, Entombed and so on. I think that way of setting up a map pool is good. I've really liked Icarus so far in the GSL. It changes how people play so it's refreshing. Same with Arkanoid when it first started in proleague. Yay so excited, great job you guys are doing. I made a post on Reddit but it isn't doing so well. Btw, the list in the OP has only 23 invites listed but Liquipedia has already added LiveZerg, is he the 24th guy? Is Pro7ect the same guy that's in TLS?